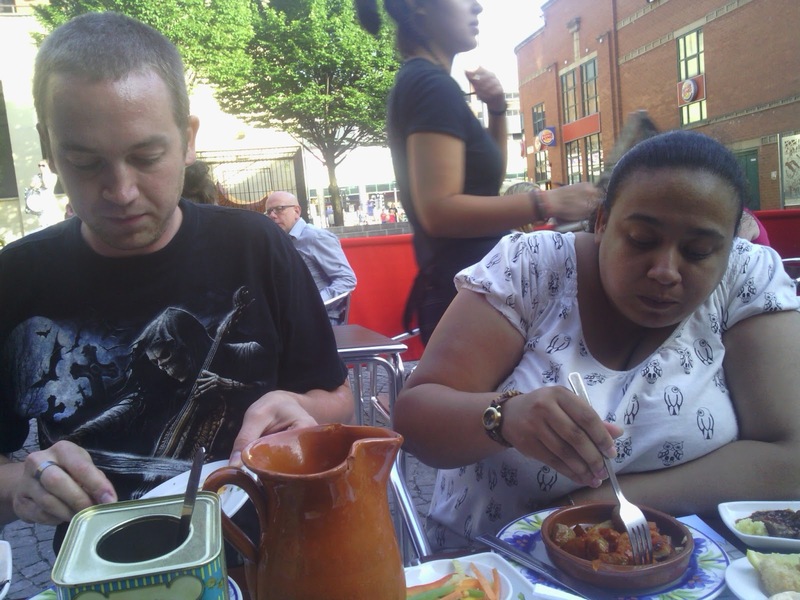 We were booked in for Saturday 6th July 2013 at 6.30pm, that is me & Paul (hubby), our 10 year old son, David and my 11 year old sister, Latisha. The waitress asked us were we would like to sit (indoors or outdoors - we chose outdoors seeing as it was a nice warm, sunny day) and seated us and gave us menus. The childrens menus were separate as they have some puzzles inside the menu and get given a small box of crayons. 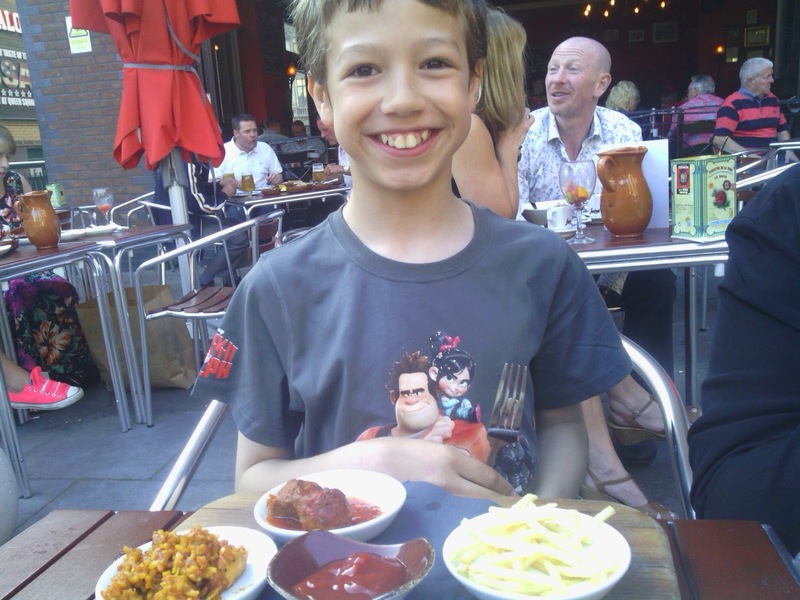 I spoke to the manageress and she explained what we could choose from for the review - 6 tapas between me & Paul plus a jug of sangria or wine or soft drinks and the childrens menu each for the kids (3 tapas, 1 dessert and a Capri sun each), also a starter of bread and oil to share. She was very nice and approachable. She explained that one of the waiters, Anthony (I hope I remember his name correctly! ), would be looking after us for the evening. He was also very nice, and very polite and made sure we were well looked after. I ordered Gambas Gabardina, a Madrid dish ("king prawns, dipped in our special-recipe San Miguel batter and fried until crisp, then served with homemade paprika & roasted garlic mayonnaise and lemon"), Patatas Bravas, an España dish ("fried potato, with spicy tomato sauce") and the 'Chef's Special' Slow-Cooked Pork Cheeks With Pedro Ximenez, a Castilla Y León dish ("served with creamed mashed potato"). I absolutely loved the pork cheeks with mash, it was cooked to perfection, very soft and succulent pork and the mash was scrumptiously creamy and smooth. I would definitely have this again and recommend it to everyone who visits. The king prawns were really nice - whenever I've had king prawns in other places, they have been quite chewy, but these were cooked just right, nice and soft and juicy, the batter was also soft and delicious and the dip complemented them perfectly. The patatas bravas were very nice too. I think I would have preferred them a little spicier. They were different to the ones I had on holiday in Barcelona in a few weeks ago (the ones I had there were fried potato with a mayonnaise and spicy dip), but I assume it is just a regional varaiation. They were very nice anyway - they are like half size potato wedges in a spicy tomato sauce. We waited a reasonable amount of time for our food to be served. We got to enjoy a glass of our sangria while we waited and enjoy sitting out in the warm evening air. It was a very pleasant atmosphere at the restaurant too. The staff all look pleasant and approachable and cheerful which is nice to see. They even have Spanish style music playing to give an authentic feel of Spain! I felt that the food was very well presented and I was very, very impressed with how well my food was cooked too. It was perfect - I'm a fussy eater in general, so for me to give a 'perfect!' is quite rare. Everything was just as described. I very much enjoyed my sangria too. It wasn't too strong, nor was it too weak. I find sangria is very varying in taste from place to place. I liked it very much though. It had a good selection of fruit pieces in - orange, lemon and lime. The bread and oil starter was delicious too. I very much enjoyed that. Overall, I was very, very pleased with the meal, the atmosphere and the service. Paul ordered Pimientos De Padrón, a Galicia dish ("imported directly from Padrón - hot! "), A Festival Of Mushrooms, a Rioja dish ("chestnut and button mushrooms, sautéed in garlic butter and white wine") and Tortilla Española, an España dish ("Spanish omelette, served with a spicy red pepper tapenade and roasted garlic mayonnaise"). "I was impressed that there were quite a lot of veggie choices. There was a good variety of things I could have - I didn't feel like a second-class person just because I wasn't having something meaty. I liked it all, my favourite was the mushrooms - they were nicely coated in the flavouring, but not dripping with oil like some takeaway ones I've had before. There was a good variety of mushrooms and they were soft and flavoursome. The peppers/chillies were nice, but they were not as hot as I was expecting, they were nice anyway, but from the description on the menu, I was maybe expecting something a little hotter. The omelette was nice too. The bread and olive oil starter was nice. I very much liked the sangria too. There was a nice lot of fruit in the sangria, I was pleased there wasn't too much ice, but it was still nicely chilled. The tables were well set out to give you plenty of room to sit comfortably. The waiters & waitresses checked everything was alright and the food was brought out in a timely manner and the tables were cleared quickly after we'd finished. There was a friendly and relaxed atmosphere and the music was on but not over the top, so you were able to chat comfortably." David ordered La Tasca's Meatballs ("La Tasca's beef and pork meatballs, served in a tomato sauce"), Paella Of The Day ("chorizo and chicken paella") and French Fries ("served with tomato ketchup"), Chocolate Brownies ("served with vanilla ice cream") for dessert and a blackcurrant Capri Sun drink. "I thought it was very yummy and all the food was nice and done well. My favourite was the paella, it was just right. 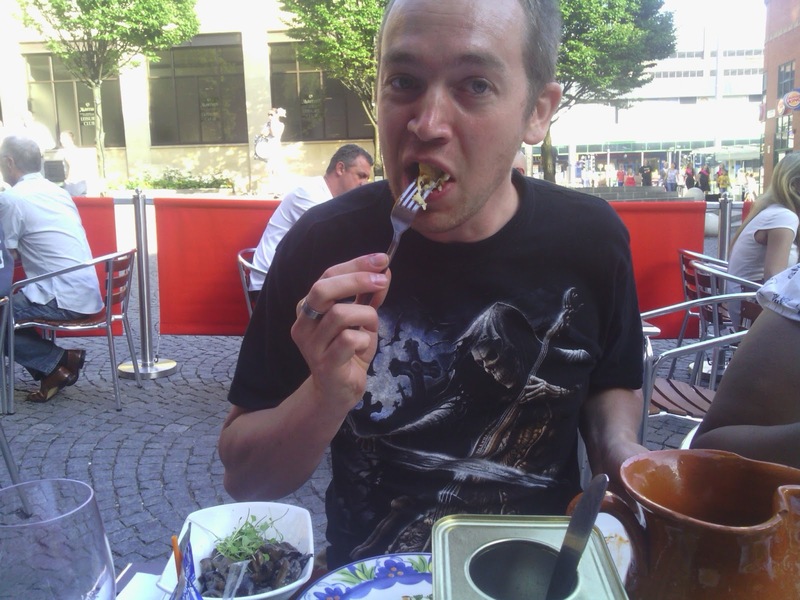 I wish there was a bit more food, I was a bit hungry afterwards. I wish there had been a little more choice in dessert too." 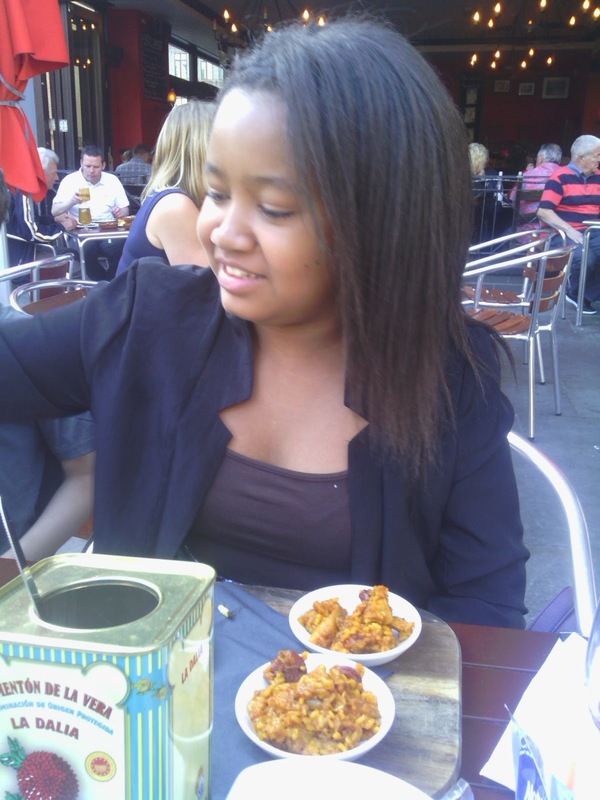 Latisha ordered two lots of Paella Of The Day ("chorizo and chicken paella") and French Fries ("served with tomato ketchup"), Chocolate Brownies ("served with vanilla ice cream") for dessert and a blackcurrant Capri Sun drink. "It was lovely and the paella was my favourite. I think more would have been better though. It was cooked fabulous." 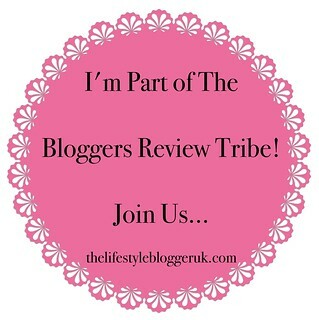 Hello i was wondering if i could have your email address, i'm a PR and have a opp for you ?